In order to find media assets quickly, we need to make them searchable, and in order to do that, we typically "tag" them with metadata. This metadata can describe the content in several ways, but at a minimum it would include a filename with file type, timecode, and duration information. Traditional metadata might also include ratings, descriptions, or relevant keywords. When it comes to metadata, the more you have, the better your chances of finding exactly what you need. Metadata gets attached to the media in a process called logging, which is usually done manually. In the case of live programming, it can be done on the fly so that the media is instantly searchable. For prerecorded content, logging can be a very labor-intensive, tedious, and potentially expensive process that can often lead to inaccurate metadata tags. The cost of manual logging can be $40-80 per hour, not to mention that it can be two to four times slower than real time. Transcription, at $1 per minute, is no better. Captioning can also be pricey at about $4 per minute. If an asset library has no metadata to begin with, such as one that has only recently been digitized, then inserting that metadata after the fact can be an even more daunting job - one that could overwhelm even the most well-funded and well-staffed media organization. It is for those reasons that many assets go without sufficient metadata, and, in turn, go unused. It is against this backdrop that the benefits of implementing a phonetic-based dialog search tool become clear. Dialog searching not only makes a difference to major networks but to plenty of others, such as news and reality show producers, corporate or nonprofit media departments, advertising departments, houses of worship, and sports distributors. One such tool is Nexidia Dialogue Search, a phonetic-based system that lets you search using plain language by phonetically indexing a media library. That process results in metadata that is searchable based not on the information that has been typed into the metadata fields during the logging process, but on what is actually spoken on the audio tracks. When you select an asset or library for indexing, software analyzes the audio tracks and creates a searchable index of the dialogue. Unlike speech-to-text methods, this system does not miss important keywords and proper names. Once the index is created, metadata is no longer required to search for an asset (though the system can indeed work in conjunction with any existing metadata). Suddenly it's possible for anyone - from the largest broadcaster to the smallest nonprofit media department - to search massive media libraries in seconds, and likely uncover assets they couldn't find for years or didn't even know they had. Dialogue Search can work alone or in concert with the existing metadata in many media asset management systems, providing an additional layer of search power and increased accuracy. 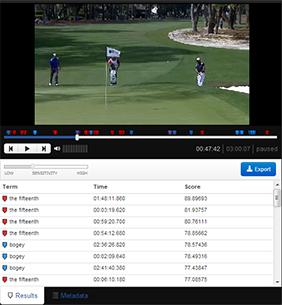 In sports distribution, the goal is to publish the content as quickly and as accurately as possible with as much value-added information as possible, such as instant replays, team and player statistics, highlight packages, and archive footage - all of which help to attract and retain viewers and all-important advertisers. Dialogue Search makes it possible to find a precise clip almost instantaneously so that you can insert it immediately into a package or distribution flow. The ability to find specific clips within an entire archive of sports video, means that sports teams and other sports-content distributors can enrich their programming - and reap the financial benefits - like never before. Advertising is another scenario where Dialogue Search can make a remarkable difference. By using the tool to hone in on opportunities that would appeal to specific advertisers, you can more effectively tailor advertising pitches and packages to those advertisers and even uncover new opportunities, all of which can lead to increased ad revenue. For example, suppose you want to sell commercial spots to BMW. You could use Dialogue Search to identify all of the mentions of BMW or luxury cars or associated lifestyles within a specific show or a specific period of time or whatever parameters are appropriate, and then present that data to BMW, or other luxury brands, to sweeten its advertising schedule, promote renewals, and potentially garner more ad dollars. Unlike in sports, ad sales, or many other workflows, where the aim is to monetize content, houses of worship are motivated by the ability to reach more worshippers in more places or in new ways. With their untold amounts of audio and often limited resources, houses of worship are the ideal users for Dialogue Search technology. Dialogue Search lets houses of worship tap into their archives in a way no MAM ever could, so that they can make the most of their assets and extend their reach. For example, using Dialogue Search, a house of worship could allow homebound people or those in hospitals to watch certain sermons on demand on their computers or laptops; travelers or commuters to call up last week's service on their smartphone or tablet; church group leaders or students to access content as research for a lesson or project; and even pastors to revisit old sermons as they prepare new ones. At the same time, internal users could edit services for streaming or repurpose archived material for special productions that focus on particular topics. When it comes to the way in which film editors interface with footage, little has changed in the last 20 years except that they have to deal with ever increasing amounts of digitally acquired footage that they then have to process within ever decreasing timeframes. The ability to locate content quickly, particularly in unscripted productions, is a key benefit of Dialogue Search. As media organizations of all types build up ever larger stores of video and audio content, the ability to locate specific bits quickly and efficiently will play a huge role in their success. Phonetic-based searching is an indispensable tool for any media-centric organization that must find that one clip among thousands - or even hundreds of thousands - of hours of media, especially when metadata is limited or nonexistent. With Dialogue Search, media is immediately accessible without the time and expense of logging or transcription.